A Large Selection of New Name Brand Mattresses! 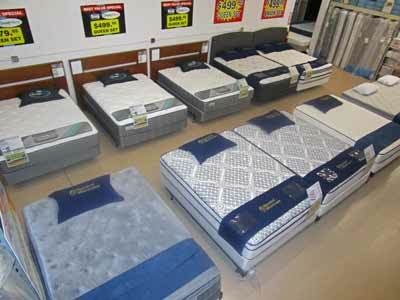 Best Value Mattress Warehouse sells bedding products at the most competitive prices to be found. No matter if you are looking for kids bedding, twin, full, queen or king sized mattresses we have them at the guaranteed best prices compared to anyone in Indiana! Best Value Mattress also has bed frames and box springs and offers delivery services in the Indianapolis area. Come in to our bedding showroom on the Northwest corner of Indianapolis and try out the many mattresses we have for you to see touch and feel how comfortable they are. Your body uses sleep (and water) to cleanse, rebuild and heal each night. Good sleep has been demonstrated to be important to good health. Not getting a good night’s sleep over a long time is a real health hazard. If you are driving on little sleep, it can be dangerous and even deadly. Getting good sleep is a lot easier on a good mattress! When you consider the benefits of good sleep, the difference in the price of a really good bedding and not-so-good is truly a small cost. Make sure you get a mattress that is big enough and made of the right material for you to feel comfortable. 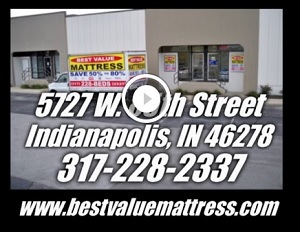 Whatever size and material is right for you, the best quality at the best price in the state of Indiana is at Best Value Mattress, Indianapolis. We make getting new bedding to your home easy for you with delivery services options in the Metro Indianapolis Indiana area. If you have a truck or a vehicle that can move your new mattress, (and are so inclined) you may load your purchase from our dock at the back of the store. Best Value Mattress Warehouse stocks bedding from Corsicana, Symbol, Southerland, Boyd Specialty Sleep Mattresses, EasyRest Mattresses and Simmons BeautyRest Mattresses. We feature factory Clearance Mattresses from Sealy Posturepedic, Sealy Optimum, Serta, Serta iComfort, Stearns and Foster Mattresses, Simmons BeautyRest, Hotel Collection Mattresses, Kingsdown Mattresses. We also carry Headboards, mattress covers, pillows and pillow covers. Best Value Mattress Warehouse is conveniently located on the Northwest side of Indianapolis just East of the West 86th street exit of 465. Our new retail store is just South of Huntington Bank (5640 W 86th St, Indianapolis, IN 46278). If you are hungry for BBQ and are at Squealers Award Winning Barbeque (West 86th, Indianapolis, 46268), then you are near the Best Value Mattress Warehouse. Turn by the Taco Bell at 5721 W. 86th Street, Indianapolis, Indiana 46278. Get Directions Here!